Love that women are able to recycle so many precious dresses, with all the waste in the world as is... I love this concept! Dress was purchased as a sample from a bridal boutique in NYC. It is incredibly flattering bringing you in at the waist without cutting you off and giving you a gorgeous long shape with the seams along the front and the skirt. 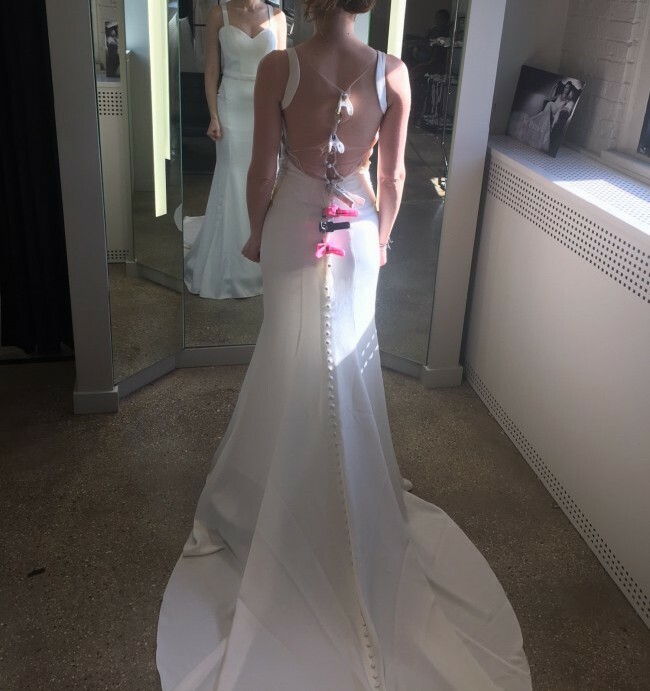 Also, the sweetheart neckline and sheer back is very flattering on the bust because you get the illusion of an open back but with support! It exudes simplicity and elegance! This dress is a size 8 never been altered. The train & buttons are gorgeous however there are a few buttons missing along the sheer back and train which will be easy to replace as the buttons go all the way to the bottom of the dress (if you hem anything off you can just steal those buttons :)) - this is a really easy fix. Also the inside liner by the zipper is slightly frayed but this is on the inside and not noticeable at all once zipped. I sent the dress for a professional clean and the ivory color looks just like new, so beautiful!! The last two photos are of original owner in the actual dress before the cleaning, has not been worn after cleaning. I will mail the dress in the original garment bag from the bridal salon. Description: Embrace modern minimalism with this chic bridal gown from the Essense of Australia wedding dress collection. It features tailored, clean lines of Crepe in ivory. The back is unforgettably romantic with its flute-shaped train and sheer magic illusion back with fabric covered buttons. Because of its long, slender lines, this dress works magic to help a petite bride appear taller! Once you send a message, Eren can invite you to purchase the dress.